Found northwest of the Dwarven mining carts, the Barbarian Outpost has become increasingly popular in recent years with the introduction of features such as Otto Godblessed's training and an easy access route to the Ancient Cavern, which, as well as being the only location of Mithril dragons in the game, also happens to house Kuradal's Dungeon. For the less Slayer-minded, there is the ever-popular Barbarian Assault minigame, the only way to earn the fabled Fighter Torso as well as various quest start points, access to Lighthouse Dagannoths to the north, and even a shortcut to the Grand Tree (provided you have 37 Agility or higher). If that isn't enough, the Barbarian Outpost also happens to host the highest level Agility course in the entire game, where Gunnjorn will happily give out an Agile Top, if you can earn it, that is! 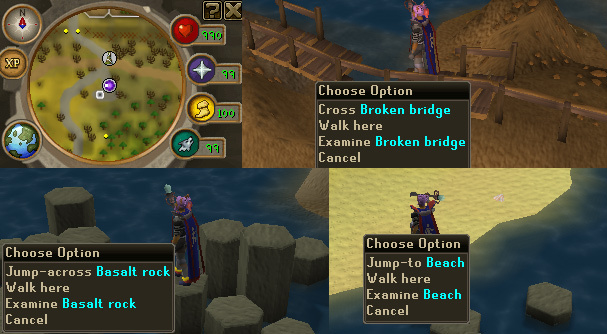 There are many ways to get to the Barbarian Outpost, ranging from walking from Camelot or Ardougne to teleporting right there with a Games necklace. You can also teleport with a Lyre (from The Fremennik Trials quest), a Teleport to House tablet, providing your house is in Rellekka, or a Rellekka tablet (from Love Story quest). From there, it is a short run to the west, edging across the broken bridge and then continuing west before traversing the Basalt rocks to the south when you reach the Lighthouse. This will take you to directly north of the Barbarian Outpost, a rather long-winded approach, but much faster than walking the entire way. Barbarian Assault is a very popular minigame. It has varied rewards, ranging from Penance armour which will replenish Prayer points over time to XP potential which gives double experience in Firemaking, Agility and Mining. For these reasons, it is often very busy and therefore it is not hard to find a team. If you're interested in Barbarian Assault, there is an excellent guide here. It's also worth noting that there is a deposit box in the Barbarian Assault lobby, which is extremely useful for banking items such as logs or fish. Just outside the Barbarian Assault lobby, there are an abundance of willow trees. 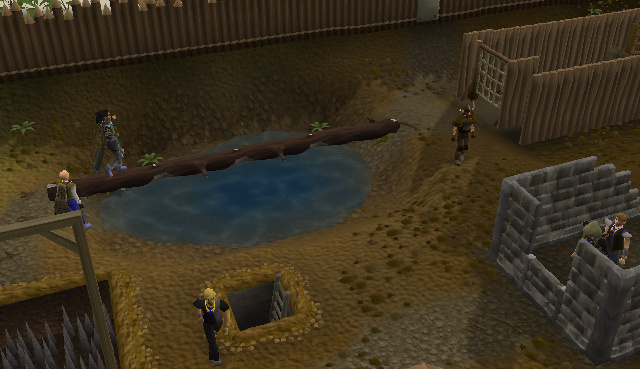 This makes the outpost a great place for training Woodcutting, as it is very easy to bank the logs once your inventory is full. 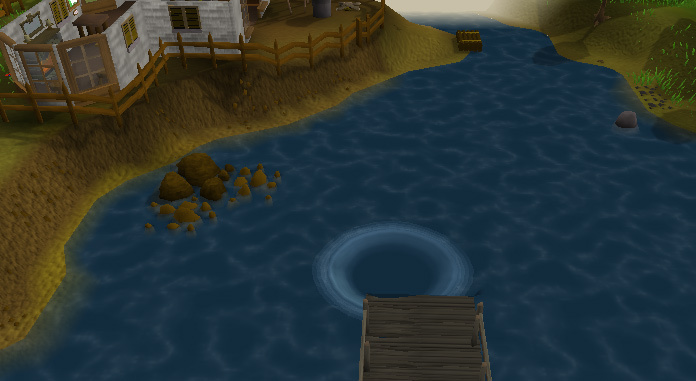 Situated just south of the Barbarian Assault lobby, there is a pier leading to a massive whirlpool. Upon completion of Otto Godblessed's training, you will be able to use the whirlpool as an entrance to the Ancient Cavern, home to Mithril dragons and Kuradal's Dungeon as well as the Dragon Forge, the only place in the game where you can make a Dragon Platebody. Alongside this, the lake is home to a variety of strange fish. Should you be able to persuade Otto to part with a special Barbarian fishing rod, you will be able to catch Leaping Trout, Salmon and Sturgeon, requiring Fishing levels of 40, 58 and 70 and Strength and Agility levels of 15, 30 and 45 respectively. These fish are used in making Barbarian mixes, but they also provide some of the fastest Fishing experience rates in the entire game! The Barbarian Agility course has two different courses built into one, both aimed at distinctly different levels. To access either course, you will need to have completed the Barcrawl challenge. Once completed, Gunnjorn will let you enter the course. The first course, the regular Barbarian course, requires 35 Agility, although higher is recommended as there is a high chance of failing obstacles at lower levels, and doing so will damage you. The second course, the Barbarian Advanced course, starts and ends in the same place as the first course, although it requires 90 Agility. This course is very different from the first, with 93 Agility making it impossible to fail any of the obstacles. There is also a reward for completing 250 laps of this course without failing, although these do not have to be in a row. 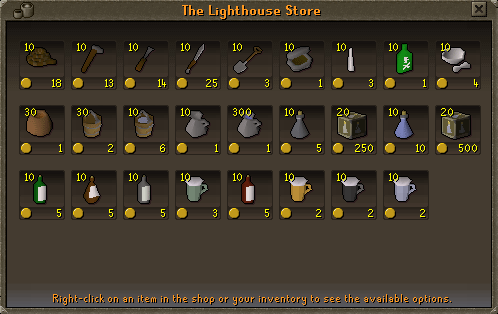 This shop is unlike most in RuneScape, for the most part, only Barbarian Assault points can be traded here. 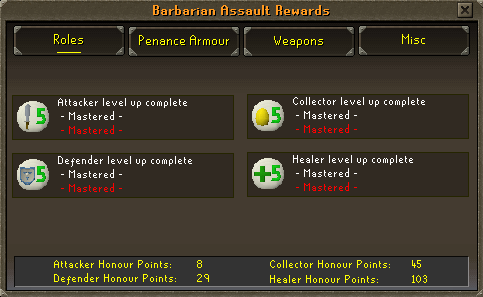 For more information on Barbarian Assault rewards, see the Barbarian Assault guide. North of the Barbarian Assault lobby and across the Basalt rocks, Jossik mans a Lighthouse. This area plays a key role in the Horror from the Deep quest and, upon completion of the quest, there is a room filled with Dagannoths underneath it. Jossik will also supply you with prayer books, should you lose yours. Jossik will also sell you a variety of items, including all the items you would find in any other General store. There is also a certain Hard-level Uri emote Clue Scroll which will take you to the top of the Lighthouse, where you will have to fight a Double Agent (level 170) in order to continue the trail. Jossik owns the Lighthouse north of the Barbarian Outpost. He features heavily in the Horror from the Deep quest and will give you Prayer books upon its completion. He also runs a General store which sells various obscure items, such as Greenman's Ale and poison, in addition to the regular General Store items. Commander Connad is the man in charge of Barbarian Assault. He has been tasked with presiding over the Barbarian's perpetual slaughter of Penance in an attempt to atone for their sins. He also gives out rewards in exchange for Barbarian Assault points, including allowing players to gamble their points for a random reward. Rumour has it, the fabled Dragon chainbody can be won in this way. Captain Cain helps Commander Connad run Barbarian Assault. If you want to reset your wave, he can be found in the Barbarian Assault lobby and will happily reset it for you. He also offers Barbarian Assault training for the inexperienced who are eager to learn. Otto Godblessed lives in a shack southwest of the Barbarian Assault lobby. He has spent years accumulating knowledge and therefore has a lot to teach anyone willing to learn, from Smithing hastas, a special one-handed spear, catching tuna and sharks without a harpoon, lighting fires without a tinderbox and even fighting Mithril dragons and creating Pyre ships for their remains. If you are lucky, rumour has it, you may even find a Dragon Full Helm. Gunnjorn is the head if the Barbarian Agility course. He created the course in order to test his fellow barbarians and help them in their training. However, if you can prove to him that you have what it takes to mingle with barbarians, he might just let you have a go. As well as the above, there are various attackable Barbarians and chickens around the place, should you wish to indulge in combat while at the Barbarian Outpost.